Google had $209,624 in profit per employee in 2008, which beats all the other large tech companies we looked at, including big hitters like Microsoft, Apple, Intel and IBM. Correction to the numbers above: Baidu’s numbers are in Chinese RMB, not USD. Just over $30k: IBM, Yahoo, Amazon and Dell. Around $64k: Oracle and Intel. Around $120k: Adobe and Cisco. A battle against overhead due to size? One would imagine that the larger a company gets, the more difficult it becomes to minimize overhead and costs. For example, HP and IBM, by far the largest companies listed here in terms of sheer size, have a relatively low profit margin per employee. In that sense Microsoft is doing a very good job considering that they are close to matching Google in spite of having 4.5 times as many employees. And of course, looking at overall profit for the company, Microsoft is way ahead of every other company on this list. We’re definitely not financial analysts, but it seems to us that Google is doing a really good job keeping their company profitable even though they have grown so rapidly (Google just turned 10 last year). Further reading: You might want to check out our two previous posts in this little series, the first being about how much money these companies are making, and the second one being about how big they are. Hat tip to Daniel Howard who asked us for the profit per employee numbers in the first place. All the companies we included in this survey are publicly traded on NYSE/NASDAQ. Although Sun was recently bought by Oracle, we included it anyway. Is this FTE (full time equivalents)? I remember the first round of big layoff, Google let off a lot of contractors and this would certainly have skewed the figures. Separately, I’ve seen a lot of my clients make redundancies but replace them with contractors. They do this to comply with head office requirements to reduce headcount. I have a feeling that this is going to be the year that the antitrust regulators come down hard on Google. It’s getting too powerful, it has market inertia behind it, nobody else can compete, and Google has so far acted without restraint in acquiring companies and partnering. I predict the end of exclusive contracts with Google and partners. It’s just a matter of time. These numbers are incredibly misleading. If you filter out Apple’s retail employees, they are far and away the most profitable per head. Of course, leave it to the Wall Street bozos to not think through stuff like this. Some Large Companies in Japan seems to have much higher profit per head. Nintendo’s Net income in 2008 is 257.342 billion Yen(about US$2.5 billion), with 3768 Employees. That means $660k per head. You should do a comparison of some non-tech companies. It strikes me that at that lower end of the range ($20-30K EBITDA/employee), you could probably find retailers and cement companies with the same level of profitability. Oracle’s FTE and FTE/Contractor workforce is, as of today, 76,312, including Larry. There are probably some contractors not included in that,but drips and drabs. So you’re around 18% off for O.
I’d have to say CraigsList. If you could count the profits made from the American Women Prostitutes who work for CraigsList. 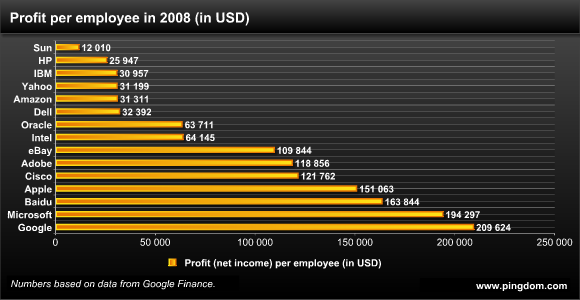 Google’s net income per employee (efficiency) has actually declined. In 2006 for instance it was maybe twice as much. Microsoft’s efficiency has stayed around the same. This number suggests one reason why the Google hiring binge made sense. @Emmanuel: Microsoft’s margin is indeed very high, higher than Google’s. …is that net profit or gross profit? Either way, the numbers are pretty staggering! Is this restricted to U.S. tech companies? Where is Research in Motion? 6 Billion in revenue in ’08, 10k employees. Assuming 20% profit you’re looking at 200k+ per employee. Ballpark numbers to be sure, but even if they are 30% off it still ranks near the middle of the list. So, does that mean all the Google employees are getting either a raise or a nice bonus? No? Thought not. Really.. You use Google. Everyone uses Google. No other search engine can get enough users before they go bankrupt. It’s what’s known as a “Monopoly”. They have all the users, they make a small fortune. They jumped into free email, now cloud computing. Because everyone uses Google, anything they do will be more popular than another companies similar product. Oh, and they read your emails as well as catalog your searches to send you targeted popups/ads. Which means their advertising has a higher rate of being clicked on. In other IT terminology, that’s illegal. Shameful Nintendo wasn’t included, when it handily beats any of these companies on this category. I think it’s great that Google is making gangbuster profits. But I’d like to know where they come from. They give away a ton of free software and services. I know search advertising is their bread-and-butter, but can search alone be the largest percentage? I wonder how Microsoft would fare if they counted all the “Microsoft Certified Professionals” as employees. @Chris Google is truly an anomoly. Most everything they offer to the general public is free, and works pretty well. And yet they are very profitable by any standard. It seems like advertising is probably where they make their money. I don’t have gmail, but having them catalog my searches helps them target advertising to me on products I might be intersted in. That’s good for me, it cuts down on the amount of crap I have to look at before I see something I might want. It’s good for advertisers they get their product displayed to more people who might be interested in it. I remember the pre-Google days of searching the internet. Search results could be wildly different from engine to engine. Google managed to work it’s way to the top. Now they have to fend off preditors like Microsoft. I don’t like it when a company has undue control over peoples lives, but I don’t think Google has reached that point. These figures are not even close to accurate, both google and MS would have easily half to three quarters of their FTE headcount in contractors at any stage. Certainly Microsoft looks like a contraditction in this category considering its size. However, one must consider that MS maintains a world-wide monopoly and has not found it necessary to compete based on the merits of it’s products. In every instance where they have been forced to compete (video game consoles, MP3 players) or have not been allowed to suppress competition, they’ve fallen flat. Of course, the anti-trust goons will come after Google, they’re too big a target to resist. However, Google’s size alone does not make them guilty. The question is, has Google engaged in anti-competative practices to secure it’s position. The answer is no. As long as there are other viable entities in the search market which people may freely choose, Google cannot be deemed guilty of violating anti-trust statutes. @ 墨尔本: YouTube is owned by Google! Great work Google Employees. Thats true that its getting revenue from search ads. Best part is they segregated employees properly instead of laying off them in large numbers. Google claims that its people are very smart and full of innovative ideas which does increase its value. hi, I am a chinese business journalist who based in Silicon Valley. i am really very surprised to see that baidu’s profit is so large. you know i am from China and know this company very much, so I count it again just now. I found you made a mistake. the baidu’s 163,844 you mentioned is RMB, actually not dollars. So the position of baidu in this pic should be the NO.14, and after HP, before SUN. Their profit per head should be 24312.5 dollars. Revenues and profits per employee are definitely interesting measurements of global profitability.